On June 10, 1974, Schmidt hit one of the longest singles recorded in major league history. 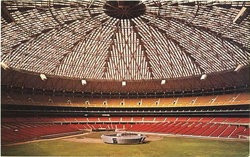 In a game against the Houston Astros, he crushed a Claude Osteen fastball off a speaker dangling from the ceiling of the Astrodome, 329 feet from the plate and 117 feet in the air. Not that Schmidt, who hit 548 career long balls, needs one more homer to validate his legacy, but come on – it should have at least been called a ground rule double! So titanic was the blast that, after hitting the public address speaker, it landed smack down in the middle of centerfield. Larry Bowa and Dave Cash, who like most everyone in the Astrodome were admiring the high sailing shot, advanced just a single base. Schmidt, midway through a home-run trot, had to turn around and go back to first and was held to a mere single. Luckily, the "homer that wasn't" wound up having little effect on the overall result of that game in Houston. The Phillies would go on to take the contest easily, a 12-0. Meanwhile, after a disappointing rookie season, Schmidt's epic one-bagger helped put him on the fast-track to superstardom, as it inspired a write-in campaign that got him elected to his first ever All-Star game--a contest which asked for his presence 11 more times before all was said and done.